At some point, we’ve all told a friend something along the lines of “cool song, can I listen?” This is when you either split a pair of headphones and hope that your friend has a sense of personal hygiene, try your luck with Google, hand over a USB drive to make a clunky exchange, or embark on a journey through iTunes’ search box on your own device. MyStream hopes to update and simplify this age-old, organic music discovery process for the 21st century. In a nutshell, MyStream is a person-to-person music discovery app. It lets you stream a song or even a custom playlist from an iPhone 3G, 3GS, or 4 to another, but you don’t have to register for a service or even have an Internet connection. If you learn about a lot of new music from your friends, MyStream means you may never have to take your chances with their headphones again. After opening MyStream and swiping through a brief tutorial, you can set a username in the app’s preferences and start selecting songs from your iPod library that you want to share. 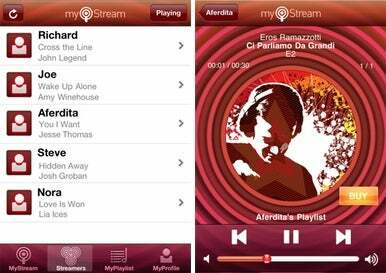 Other MyStream users can open their app, find your name in the Streamers tab, and tap songs to begin streaming. They can stream the entire song you are currently listening to, or play 30-second previews of any of the other songs you added to your playlist. Tapping the large “Buy” button that is displayed over the album cover art will take users straight to the iTunes Store to buy the current song or album. MyStream founder Richard Zelson told Macworld that he met with numerous record label representatives who were excited about his app’s potential for the industry. “There are a myriad of ways to illegally share music,” Zelson said, “and MyStream actually adheres to the existing copyright law without allowing illegal downloading and instead promoting instant purchasing.” While MyStream is free, Zelson’s company takes a small cut of every song purchased from the app (thanks to Apple’s iTunes referral program) and displays ads from Apple’s iAds network. MyStream can seek out other devices over Wi-Fi or even Bluetooth, though in our brief testing, Bluetooth streaming can be a little buggy. But MyStream’s ability to share—nay: stream—music by creating an ad-hoc network between devices, without the need for a hotspot or even an Internet connection, could catch the attention of users in search for the most frictionless way to experience new music with friends and buy it on the spot. For this launch, MyStream only works on the iPhone 3G, 3GS, and 4, and Zelson said an update to support the iPod touch should arrive within the month. You can give the app a try for yourself as it is available now on the App Store. Your iOS device will need to be running iOS 4.1 or later.